The week was full of specific training tailored to our Sales and Operations teams. From hands-on training in our internal systems to real-life presentation challenges, our teams left the meeting prepped to tackle the rest of 2017. “What I love about the convention is getting to have face-to-face interactions with the people I work with throughout the country every day. I am excited to go back and win business and fight for revenue,” said second-year attendee local sales representative Nick Kalianoff from Des Moines, IA. The company’s strategies on how we plan to address the current industry climate with continued innovative product offerings and diversifying into different markets were shared with employees in an interactive group setting. Attendees participated by providing feedback and ideas on how to implement these plans. 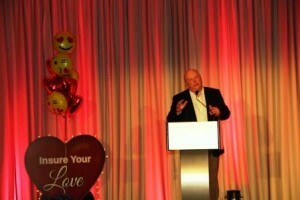 The accomplishments of last year—like the highest revenue in ExamOne’s history and top performing employees—were celebrated at an awards dinner Wednesday evening. Both groups came together to recognize each other’s successes. 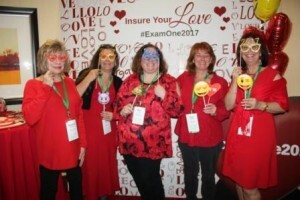 Attendees sported festive red attire and accessories to promote “Insure Your Love” month, which is sponsored by Life Happens to encourage life insurance coverage for loved ones. “What an exciting night. Being new, I didn’t know what to expect. I was shocked to win an award, but so proud. It made me feel very appreciated and validated all the hard work my team has done,” Christina Duenas, Teleunderwriting Supervisor in San Diego, CA. ExamOne’s culture has always emphasized giving back and this year we continued the tradition with a fun Lego® building block sorting and assembly project. Working with the nonprofit, The Giving Brick, employees donated new Lego sets and helped prep recycled Lego bricks to be donated to deserving children. “I know how much my kids love Lego blocks, so the fact we are able to help give other children the same sort of joy is well worth the effort,” said Cory Stout, Technical Project Manager in Lenexa, KS.